Much smoother now at low speed/revs. I read a post about the Rapid Bike fuelling module and explored a bit further and decided the "EASY" module would sort that annoying jerky/snatchy drive we all experience when riding at 30-45 mph, caused by the emission restrictions BMW choose to abide by. The difference is noticeable immediately and smooths out the ride as it should be, well worth £132.00 and reasonably easy to install, couple of youtube vids helped too. Re: Much smoother now at low speed/revs. Intrigued. I do so much commuting on the XR that this product seems to be the cure for that constant speed range where I flip between 2nd and 3rd constantly (usually sticking with 2). Do you have a link to a YouTube install vid? Sorry don't have it to hand but you'll find them if you insert "Rapid Bike easy fuelling module in the search bar. better to get a re-flash. call your dealer. They may have one. Of course all this stuff may void warranties if you have one. Yeah...I've fitted the Rapid Bikes "EVO" module to mine....great bit of kit too, really smoothed out the throttle response right across the range, especially at low throttle settings, to be honest I didn't think it was too bad to start with, but it made a big difference, much smoother and actually easier to ride slowly, it's not so abrupt anymore. The system is highly adjustable to suit your riding style/conditions, you can load the standard bike map as supplied by Rapid Bikes for a stock bike, if you have headers and a pipe it also has a map for that.....or you can make your own as I did. It even has an "adaptive" map, this takes your riding style into consideration and suggests changes to the map to suit....you can then upload this if you choose...or not. The EVO module also allows you to change the "pro-shift" timings in each gear to help smooth out the shift points....although the stock system is pretty damn good. I just had a slightly poor shift between 2nd & 3rd, both up and down, I adjusted it to a slightly longer "cut" period and it's now perfect, we're talking milliseconds here so not a great difference but noticeable in the gear changes nonetheless. I'm not sure what the "Easy" module allows you to do but it's probably still worth a good look. As far as warranty goes, I guess it depends on the country/dealer, here in Australia, the particular warranty item must be directly affected by the modifications you do for it to be denied...BMW can't deny warranty on an unrelated item, for example, they can't deny warranty on a failed brake related item if you have a fueling module fitted, likewise if you have non-genuine luggage fitted, there's a lot of XR owners out the with non-genuine luggage and I suspect the warranty would not be affected unless the luggage itself has caused a problem. I know my dealer was very interested in the Rapid Bikes module and were asking lots of questions about it. They're of the opinion that the module can only be a good thing as BMW (and hence the dealers) are hamstrung by the emissions laws in each country. This is why the engine maps are often quite poor in the lower rpm/throttle areas...they have to comply with the rules just like every other manufacturer. Looks too good to be true. Looked at the Rapid Bike site but did not provide any details for fitting to an XR - what do you have to do? Are there any downsides?? Where is the unit fitted?? 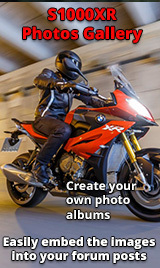 I found a good video on You Tube by doing a search for “rapid bike for bmw xr”. For you guys interested in Rapid Bike read the small print the cheapo option is for a stock bike,start putting pipes etc on it’s not good enough and that’s from the importer. Aye, this is correct...if you have a pipe or headers or both, the "Easy" module won't be much good to you....For a bike fitted with headers and pipe, or you plan on fitting them in the future, you'll need the "EVO" module. The harness is actually the same one as fitted to the "RR". I fitted the unit itself under the seat, fits nicely. Took me ~1.5 hours to fit it once all the tupperware was removed. All the connectors etc are as good or better than the stock BMW items, so they're definitely good quality.